There’s no arguing that hamsters are super cute, but are they also friendly? Can you expect your pet hamster to play with you, seek out petting and generally interact with you? 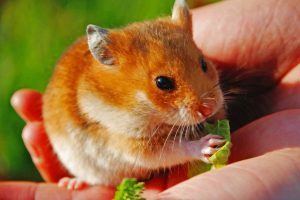 Having experienced several hamster bites as a child, I decided to investigate this question in depth, so you can get the answers as well. Hamsters can be very friendly and form an everlasting bond with their owners. 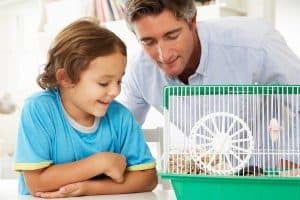 However, just how friendly he or she is, will depend on a hamster’s individual personality, as well as on how much time you spend interacting with them. So, what can you do to make sure your hamster forges a lifetime friendship with you? Read on to understand what makes some hamsters friendlier than others, and see how you can get your tiny rodent to be best buddies with you. Are hamsters considered a friendly pet? Hamsters definitely can be friendly and enjoy the companionship of their owners. Then again, some hamsters can also be grumpy, grouchy and even aggressive. Then there are hamsters who won’t bite you but still make it clear that they prefer to be on their own. So, what makes one hamster friendlier than another? Two words: Nature and Nurture. Just like us humans, hamsters have their own innate character that they’re born with. Genetics is at play here, offering a range of behavioral tendencies in every creature – hamsters included. In other words, some hamsters are simply born friendlier than others. When you first get a hamster, it can be very difficult to assess the critter’s innate nature. Most people buy a hamster at the pet store or adopt one from a friend or an online ad. They don’t really stop to choose or assess that hamster’s “personality. Even if you wanted to, more often than not, you had very little time to watch the hamster’s behavior in his or her previous home. Socialization – or lack of it – provides an additional layer to a hamster’s temperament and level of friendliness. What that word means is the amount of time a hamster spent interacting with humans while it was a young pup. Or just throughout its lifetime. The hamsters you buy from the store are often lacking in that department. Born in “hamster mills” or just accidental breeding at home, they received poor handling as pups. They get even less human interaction while at the store. The end result is that these hamsters are usually at least somewhat shy of people. That doesn’t mean you can’t win them over. You can – but you’ll have to spend time building that connection with them. Well, first, accept that there no guarantees. However, you can increase the odds of your hamster ending up your best buddy. First, if possible, get a young hamster pup and be the one to choose the right pup from the litter. Visit the home where the hamsters were born and watch the entire litter as they play together. Try to assess which of the pups is more confident and friendly. Try to handle that pup as well – very gently – before making up your mind. If you really want to get the friendliest hamster possible, buy from an ethical professional breeder of hamsters. Real breeders – not backyard breeders – that go to shows and raise generations of pedigreed hamsters are the best source for a pet hamster. 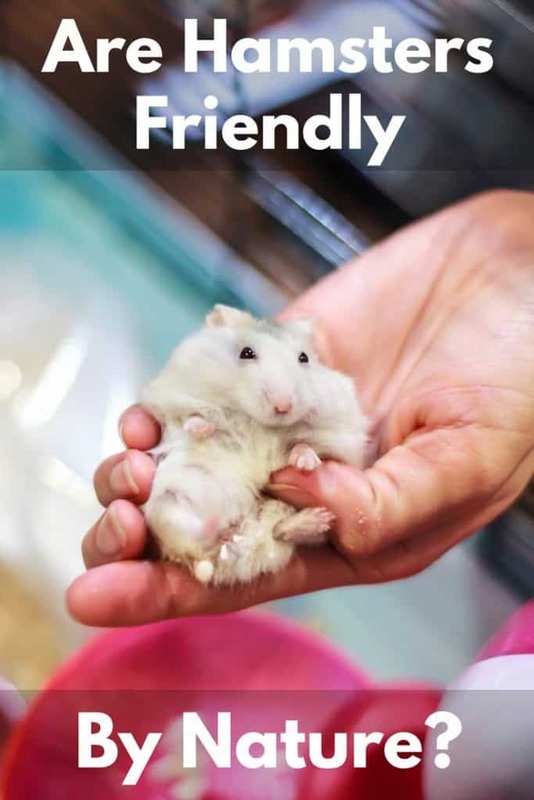 Ethical breeders make sure their hamsters are as friendly as possible, both by deliberate breeding of friendly hamsters and by paying great attention to early-age socialization. How to find them? You can start by Googling the word “hamstery” and your location. Then visit the websites and see what these breeders tell you about themselves and their hamsters. Taming a hamster to win his trust is a very important process in your relationship. Unless you raised that hamster from a very young age, you’ll have to work at gaining that trust. This is called “taming” – the process of getting your hamster to be more docile and less likely to bite or attack you out of fear. Taming a hamster is something every owner needs to know how to do. We’ll cover this in more depth in the future, but in a nutshell, this is how it goes. During the taming process, you work with your hamster on gradually getting used to being handled by you. The key here is… bribe. You’re going to introduce your hamster to your hands, gradually and with plenty of treats. The hamster will gradually learn that your hands are a very positive element in his or her life, bringing safety and the comfort of a delicious treat. Eventually, a tame hamster is the one considered “friendly”. These are the hamsters that run to their owner and enjoy being held and cuddled. Can any hamster become friendly through taming? Whether it’s the temperament they were born with or lack of early-age socialization doesn’t really matter. Some hamsters may never actually display anything remotely close to affection towards their owner. At best, they’ll learn to accept your presence in their life and avoid biting you when you try to pick them up. They’ll still make it clear they prefer to be left on their own. You accept your hamster for who he or she is. They may be tiny in size but they do have their own personality and we need to respect that. Adopting a hamster comes with a full commitment on our part to care for that pet for as long as it lives. Whether or not it’s actually friendly. See more: How long do hamsters live? Why has my hamster stopped being friendly all of a sudden? Sometimes you have a friendly hamster with whom you have a wonderful bond. Then someday, your hamster bites you. Or just shies away and prefers to stay away from you. More often than not, that hamster is sick. In fact, any change in behavior can indicate a health problem. Sudden aggression or hiding behaviors even more so. Your hamster could have an abscess somewhere on its small body, which you may have accidentally touched as you tried to pick it up. Or it could just be feeling “off” due to the onset of an infection. Sometimes, the only symptom will be a change in behavior just like this one. The smaller the body, the faster an infection can spread, so be mindful. If your hamster’s odd behavior continues, call your veterinarian (preferably an exotic pets vet) and discuss the situation with him or her. They may want you to bring your hammy in to be looked at. Another possible reason for a hamster to stop being friendly is stress. Any change in a hamster’s environment could potentially stress him or her out. A different setup of the cage, new bedding, a perceived new threat such as a cat, dog or a toddler in the room – these can all stress out a hamster. When you’re stressed, you don’t have the attention span needed to nurture a friendship. Neither does your hamster. So, what can you do? Try to figure out what’s stressing out your hamster and eliminate that factor from his or her environment. Also, after cleaning the cage and changing the bedding, allow the hamster some alone time to get to know the cage again, sniffing around and figuring out what’s where. Are some types of hamsters friendlier than others? Generally speaking, hamsters are divided into the larger Syrian hamsters and the smaller dwarf hamsters. The dwarf hamsters are then divided into several breeds: Chinese, Winter White, Campbell, and Roborovski hamsters. Although some will say that Chinese hamsters are not really dwarf hamsters. So, are some breeds friendlier by nature? 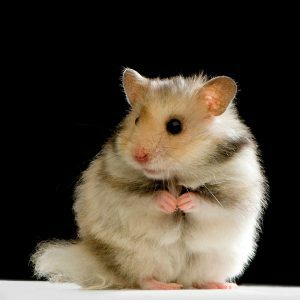 Experienced owners who’ve had more than one type of hamster seem to agree this is about the personality of the individual hamster rather than the breed or type. Generally speaking, the larger Syrian hamsters are often easier to handle and care for, thanks to their size. This makes them a better pet for first-time hamster owners, which could help with taming and bonding. If you own – or have owned a hamster – we’d love to hear more about how friendly you found him to be! Share the details in a comment below. Does My Hamster Actually Know Me?